Michael Creighton, new Idyllwild Water general manager, works at his desk. Michael Creighton is the new general manager for the Idyllwild Water District, but IWD is neither a new location nor work for Creighton. In the late 1970s, he handled wastewater testing for IWD. Living in Idyllwild, he joined the board in 1983 and left 14 years later in 1997. While on the board, he served as president for five years. He left after Tom Lovejoy was hired as general manager. “It’s a rarity to find an engineer for these jobs,” Creighton said. He considered coming back before this opportunity was available, but he was enjoying building the water program at Mt. San Jacinto College. 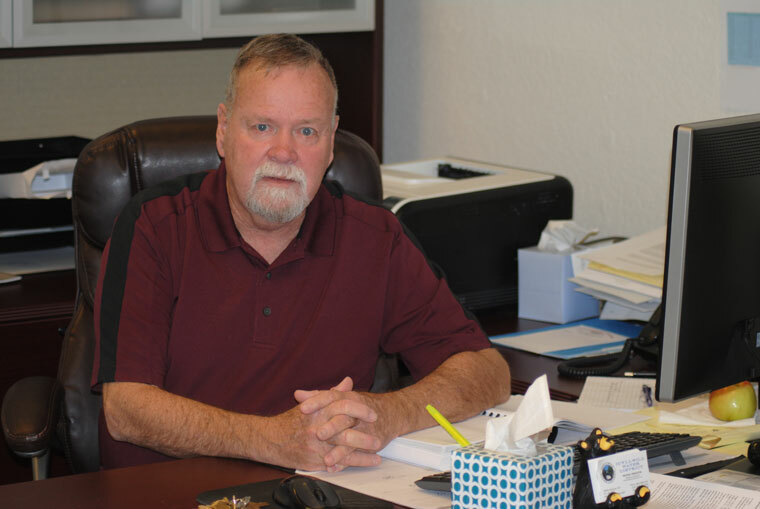 During most of his career, he worked for Eastern Municipal Water District. From water quality, he rose to director of environment and regulatory compliance. So he understands water and environmental law, and he has bountiful experience working with state, county and federal EPA officials. When he retired in 2001, he resumed his teaching at Mt. San Jacinto College. He taught one course per semester. Shortly after returning, the dean asked him to develop a complete department, which he did. This fall, the Mt. San Jacinto’s water department had seven faculty members and offered 11 courses per semester. The classes covered the water gamut from distribution to wastewater. His students had entrée to water, sewer and industrial careers. Later in this period, he worked with former IWD General Manager Tom Lynch giving courses to IWD employees. He also established his own consultancy. One of his major clients was the Pechanga Band of Luiseño Indians in Temecula. The IWD board formally approved his selection at its Jan. 16 meeting. One week later, he held his first staff meeting where he shared his goals and philosophy of water agencies. Much of the first week, he spent getting reacquainted with the district, as well as reviewing and studying the district’s current issues and water problems. Given his concern and experience with water quality issues, the current problem of too great a concentration of disinfectant byproducts is at the top. He expects the new granulated activated carbon filtration plant to be operational by Friday. He understands water customers expect reliability and sustainability. Therefore, water supply is critical. He won’t just depend on a formula comparing production and supply. He recognizes that unexpected risks can occur; therefore, a water district needs a cushion for those emergencies. “We best need to be sure we have enough water available,” Creighton stressed. He also said he would reassess the district’s capital program. “The age of the pipe matters, but where and why are there leaks?” he said were the important questions. He also plans to evaluate the staff’s ability to install pipes. He doesn’t want to start with large critical jobs, but will have projects where their skills can be expanded. Which also means he doesn’t see the need to compete with either Fern Valley or Pine Cove water districts. “I’ll focus on what I do here,” he added. Creighton is married with an adult daughter, three step-children and five grandchildren. His family supports him as he begins this adventure while approaching 70 years.